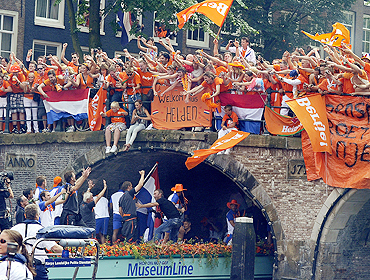 Determined not to let defeat spoil a good party, some 700,000 fans turned out to welcome the Dutch soccer team home from the World Cup in a parade through Amsterdam's canals on Tuesday. After coach Bert van Marwijk and captain Giovanni van Bronckhorst were knighted by Queen Beatrix of the Netherlands, the team were given a heroes' welcome by fans despite their 1-0 defeat to Spain in Sunday's final in South Africa. "Spain may be world champions but we have the best audience in the world," winger Arjen Robben told a crowd of nearly 200,000 gathered in Amsterdam's Museum Square. "We haven't brought the World Cup but you give us the feeling we are world champions," Van Bronckhorst said. The city had reversed an earlier decision to cancel the parade in the event of a loss, and a fleet of boats swarmed into the narrow canals to follow the parade boat as it passed under bridges packed with cheering fans, some of whom jumped into the water. The warm welcome contrasted with harsh criticism of the final in newspaper editorials which said the team had deserved to lose because of their rough play against Spain.